Note: This post is compiled from information delivered by our sublimation expert, Tom Chambers, in another venue. While I have edited and rearranged a bit, this post is based on his thoughts and ideas. One of the hardest parts of sublimating, or any business that uses graphics really, may be learning to use a graphics program. Knowing the basics of graphic design is critical for success with sublimation, so it is wise to get the education and information you need to develop your skills. There are many places that offer classes in the popular graphic design programs, and we highly recommend you take a class or two in order to keep your skills at their peak. Before you take a class however, there are a few things you need to consider. 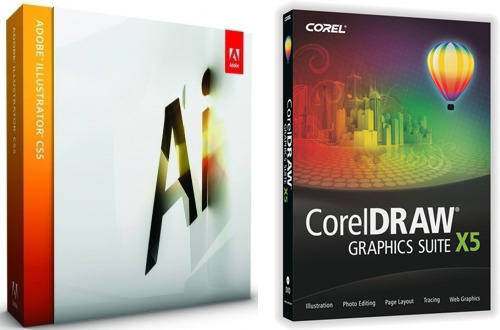 What program to use – The most popular or “common” suites of graphic tools are Adobe and Corel. Adobe is the standard for the printing, publishing and magazine worlds, but it does have a relatively expensive price point and a rather large learning curve. CorelDraw (full disclosure, Corel Draw is what we use here) is somewhat easier to learn, is less expensive and is more “intuitive” once you pick up the basics. Regardless of what program you pick, we still recommend taking classes and sharpening your skills. Vector vs. Raster: You Need Both – There are two main types of graphics that you will deal with – vector and raster. Vector images are, simply put, “clipart” type images, lines, objects or shapes arranged and assembled into a design. A lot of logos are vector designs. Raster images, by contrast, are images you’ve scanned, photos or other bitmaps containing high levels of detail. Raster images are made up of pixels, and enlarging them can cause a loss of detail. When we’ve talked about sublimation in the past, we’ve often said it’s as easy and print, press and profit, and it really is that easy. If you can print something to a printer, you can create a sublimation transfer, all that’s different is the ink and the paper. Pressing a sample is not complicated either. All you have to do is set the proper time and temperature and press, quite easy. The more complicated bits arise when you start looking at designing graphics for the goods you want to sublimate. At that point, further training and education may be necessary to help ensure that you can create the best quality graphics possible. Great article Kristine. First, I loved doing sublimation. I just wasn’t doing enough of it to justify it any longer. I’ll probably come to regret it later, but I continue to have an interest in it. One thing that doesn’t come up a lot regarding sublimation is color management and color profiles when using graphic software. Getting accurate color reproductions can be daunting if you don’t set up print profiles properly. Does the printer manage colors, or does the software manage colors? What’s an ICC profile? I think that would be a good subject for a future article. To me, and maybe I just didn’t get it, that was the one of the biggest stumbling blocks. Thanks Kristine, and as always, I enjoy reading all of your articles.